Among the many activities planned for Middle Georgia State University's 2016 Homecoming are an air show in Eastman, oyster roast in Macon, football and an international festival in Cochran, live music in Dublin and craft brew time in Warner Robins. All graduates of Middle Georgia State University (MGA) or any of its predecessor institutions are invited to the events - all with free admission - scheduled for Saturday, Oct. 22, through Saturday, Nov. 5. Many events are also open to current students and the general public. Homecoming 2016 is sponsored by the Middle Georgia State University Office of Development and Alumni Affairs. • Alumni Oyster Roast, 3 to 6 p.m. Saturday, Oct. 22, MGA Macon Campus, lakeside. Music and food. Free admission and open to MGA alumni. • Concert on the Green, 6 to 8 p.m. Tuesday, Oct. 25, MGA Dublin Campus. Live music and food. Free admission and open to alumni, students, faculty/staff and the community. • Craft Brews & Conversation, 5 to 7 p.m. Thursday, Oct. 27, Just Tap'd, Warner Robins. Beer on tap. Open to alumni. • Pre-Game Extravaganza, 3 to 6 p.m., Wednesday, Nov. 2, Cochran Campus. Carnival-style activities, food and music. Free admission and open to students and faculty/staff. • Knights International Festival, 3 to 7 p.m., Thursday, Nov. 3, MGA Cochran Campus, lakeside. Free admission and open to students and faculty/staff. • Ebenezer Hall and Alumni Center Grand Opening, 5 to 7 p.m., Thursday, Nov. 3, MGA Cochran Campus. Free admission and open to alumni, faculty/staff and the community. • Football game, Homecoming queen and king announced, fireworks, 7 to 10 p.m. Thursday, Nov. 3, MGA Cochran Campus, NeSmith Field. Free admission and open to students, alumni, faculty/staff and the community. • Comedy Show, 7 to 9 p.m. Friday, Nov. 4, Cochran Campus. Two stand-up comedians will perform on campus, location to be determined. Free admission and open to students and faculty/staff. • Heart of Georgia Air Show, 10 a.m. to 3 p.m., Saturday, Nov. 5, MGA Eastman Campus. Free admission and open to students, alumni, faculty/staff and the community. This second annual air show marks the 20th anniversary of MGA's aviation campus in Eastman. 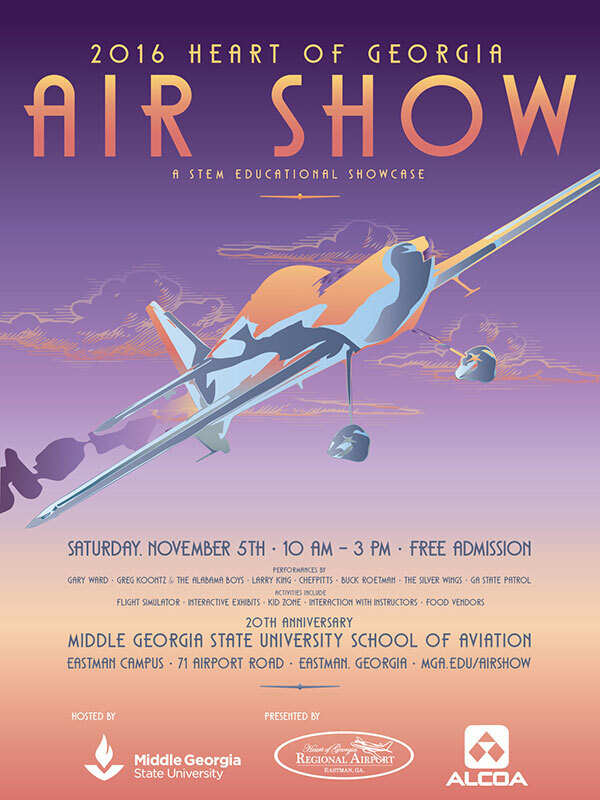 The show will feature amazing aerobatic flying performances in a venue that showcases the Eastman community, the Heart of Georgia Regional Airport and the high-quality programs offered at Georgia’s only university with a public aviation program. Scheduled performers: Gary Ward; Greg Koontz and the Alabama Boys; Larry King; Chefpitts Airshows; Silver Wing Parachute Demonstration Team; and Georgia State Patrol - Helicopter water bucket simulation. In addition to these feature aerobatic performances, this family friendly event will include a flight simulator, food, children’s inflatable toys, face painting and interactive exhibits for all ages. Air Show presented by ALCOA and Heart of Georgia Regional Airport. Middle Georgia State University campus maps and directions are at www.mga.edu/about/maps.aspx. For more information, contact the MGA Office of Development and Alumni Affairs at development@mga.edu or (478) 471-2732.